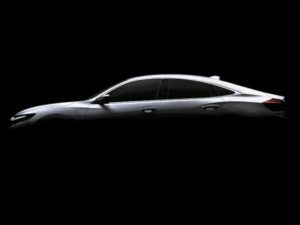 Honda will unveil a prototype of the next Insight hybrid at the Detroit Motor Show, featuring a new two-motor hybrid system aimed at rivalling the economy of the Toyota Prius and Hyundai Ioniq. Previewed as a silhouette, the third-generation Insight will arrive three years after its predecessor was discontinued. Previous Insights (as well as the CR-Z coupe and Civic Hybrid) had used a system called Integrated Motor Assist, which used electric power to aid the petrol engine but didn’t allow for all-electric driving, unlike most rivals. By comparison, the i-MMD setup features two electric motors, similar to most rival hybrid products, and enables short-distance electric driving, depending on the conditions. This will also be used by the refreshed CR-V, which is due to swap its 1.6-litre diesel engine for a hybrid drivetrain next year, and the forthcoming Clarity plug-in hybrid. The Insight launches in America next summer, and will be built at Honda’s plant in Greensburg, Indiana, alongside the Civic and CR-V for North America. Honda has no plans to bring it to Europe.